In a strong message to cow vigilante, Prime Minister Narendra Modi on 29 June said people involved in violence in the name of protecting cows is not acceptable. "Killing people in the name of Gau Bhakti is not acceptable. This is not something Mahatma Gandhi would approve of. 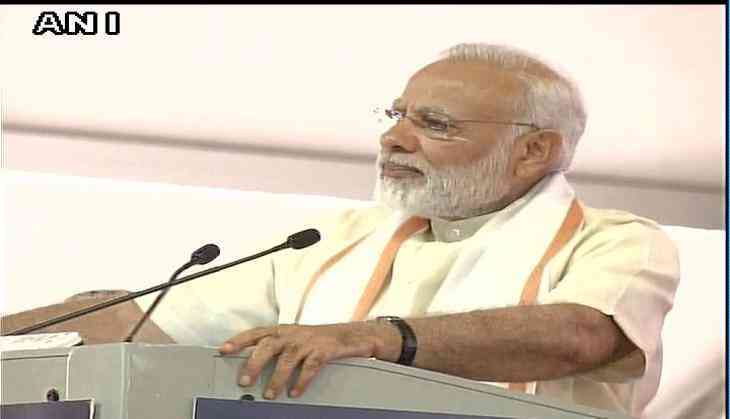 As a society, there is no place for violence," Prime Minister Modi said at Sabarmati Ashram centenary celebrations here. Asserting that violence is not a solution of any problem, the Prime Minister further said no one has the right to take the law in his or her own hands in this nation. "Today I want to say a few words and express sadness on some of the things going on. We are a land of non violence. We are the land of Mahatma Gandhi. Why do we forget that? No one spoke about protecting cows more than Mahatma Gandhi and Acharya Vinoba Bhave," he added. He further urged the people to come together to create a country that would make the freedom fighters proud of. "Let's all work together. Let's create the India of Mahatma Gandhi's dreams. Let's create an India our freedom fighters would be proud of," he said. Prime Minister Modi, who was speaking at the 150th birth anniversary celebrations of Mahatama Gandhi's guru Shrimad Rajchandraj, also released a special postal stamp and commemorative coin in his honour. During the last few months, incidents of mob lynching, violence, murder in the name of cow protection have been increased causing a tense situation across the country. Recently a man was thrashed and his house was set ablaze in Jharkhand after a dead cow was found outside his house.